Is it possible to fall madly in love with a pair of shoes? I am definitely a heels girl and can’t go without them normally but this pair of sandals has completely tuned me into the world of flats. I can’t stop staring at my feet which can be a problem when you are meant to watching where you are walking or when your best friend is pouring their heart out to you about boyfriend problems! Goldie London is one of my favourite boutique designers and is a young fresh London-based designer who captures the whimsical cheeky girlyness in all of us. From the lanes of Portobello Market five years ago to the flourishing label worn by celebrities such as Mischa Barton, Goldie’s 2010 collection is inspiring and stunning! Sadie dress in blush – T-shirt dress with floral beading and cut outs at shoulders – gorgeous! I love finding out about the history of an object, accessory, item of clothing or fashion trends and they originated. It’s often something simple and often unrelated to it’s purpose today. Fashion first fell in love with the sea in 1846, when Queen Victoria dressed her four-year-old son, Albert Edward, in a sailor suit to wear aboard the Royal Yacht. From this time the look became typical for children and fashion-conscious bathers. Nautical trends are as regular as tides. Fashion houses such as Chanel and Ralph Lauren frequently draw inspiration from the navy, creating preppy manifestations of maritime wear including brass buttons and bell bottoms. Avant-garde designers such as Vivienne Westwood and John Galliano are also known to reference the more sinister side of sailing in pirate-influenced collections. As with many trends, the rule of sailor chic is to keep it simple. Stick to the basic blue and white colour scheme and contrast with nautical elements with everyday wardrobe pieces for a successful result. I will definitely be popping in to get my fix! The Enchanted Palace reveals the emotion and drama running through Kensington Palace’s history. Contemporary fashion collides with the Royal Ceremonial Dress Collection and real stories from the palace to create stunning installations, fashioned by world-famous designers including Vivienne Westwood, William Tempest, Stephen Jones, Boudicca, Aminaka Wilmont and Echo Morgan. Maxi Dresses – One Quick Step To That Holiday Feeling! These super comfy, easy to wear dresses can be worn casually with flats or dressed up with a pair of heels and accessories. Maxi dresses are very chic, sleek and give a great illusion of length. This dress has lovely shape and would emphasise curves or create a waist, as well as create some extra length for shorter ladies. I am drooling over these colours which are spot on with the current native/tribal trend. This shape is flattering to almost every shape but avoid this big print if you are on the shorter or more petite size as it could swallow you up. I know, more embellishments! Even though we have had our fair share, I still can’t help but be drawn to these tiny pieces of sparkly metal. This one is a bit more dressy than the first black one above and doesn’t need much jewellery or accessories added to it. This dress has great support and shoulder straps for top-heavy girls. Vibrant brights add a sense of excitement to the palette, especially when set against practical neutrals that provide a safety net for cautious consumers. Have a look around you to see these colours everywhere, whether it’s in the current army trend or the floaty florals! 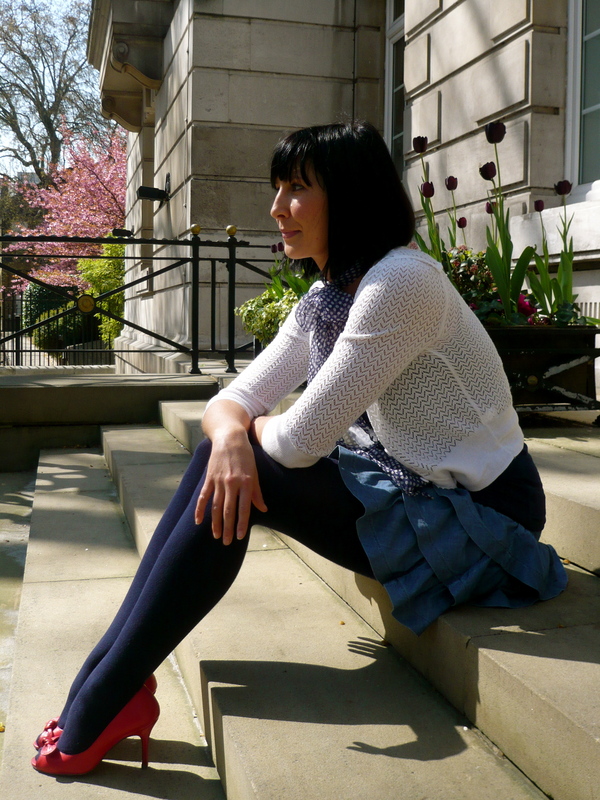 Wardrobe Diary – Friday 23rd and the first mild day of the year! 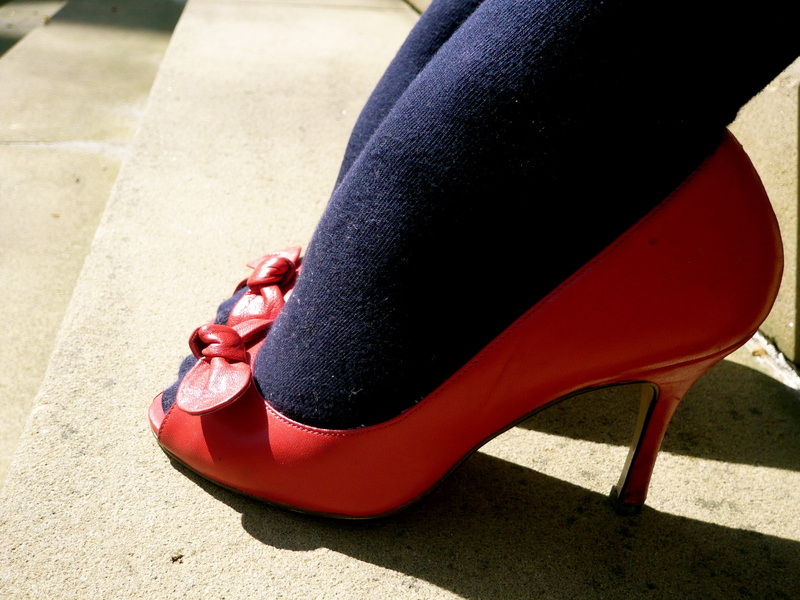 Today I fancied wearing my favourite peep toes which always blast me into the 1950’s and put a spring in my step. From there, I drew inspiration from the current denim trend with my ruffle skirt along with navy tights, a navy vest and pretty three-quarter cardigan. 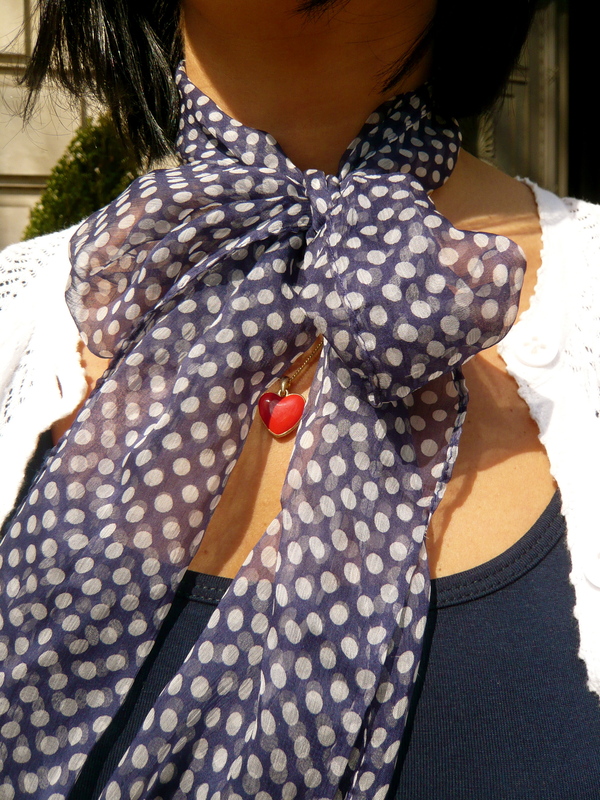 I accessorised with a navy and white polka dot scarf keeping in the 1950’s theme. Adding accessories that are currently in trend are a cheap and easy way to keep your outfits up to date.